We are excited to share with you Hablah blah blah’s new collection of multilingual music because their first CD in Spanish was the very first album we reviewed when we launched in 2009! Not only that, but Amy Conroy, the company’s founder, has shared with SpanglishBaby many stories of her family’s immersion trips to San Miguel de Allende in Mexico. After almost a five year hiatus, Habla blah blah is back, but with a new multilingual and immersive-style concept that will not only get our niños singing along and dancing, but will also expose them to familiar words and phrases in English, French and Spanish! These catchy tunes feature songs with themes that appeal to a child’s everyday life and their curiosity of the world around them. El Baño, Los Grandes Elefantes and Escondidos are a few of the songs you’ll find in these CD’s that are reminiscent of songs we might have heard as kids, but with a modern twist. The songs are the same across all five albums, the only thing that changes is that the voices and lyrics are in a different language. First, kids can listen to the songs in their native or preferred language and then switch to the album with the target language. The idea behind this method is that when your kids switch to the album in the target language their brain will start making the connections before they even read the translations. You can read more about the music and how it works on their website. Listen to a preview of the first song in all three languages here. 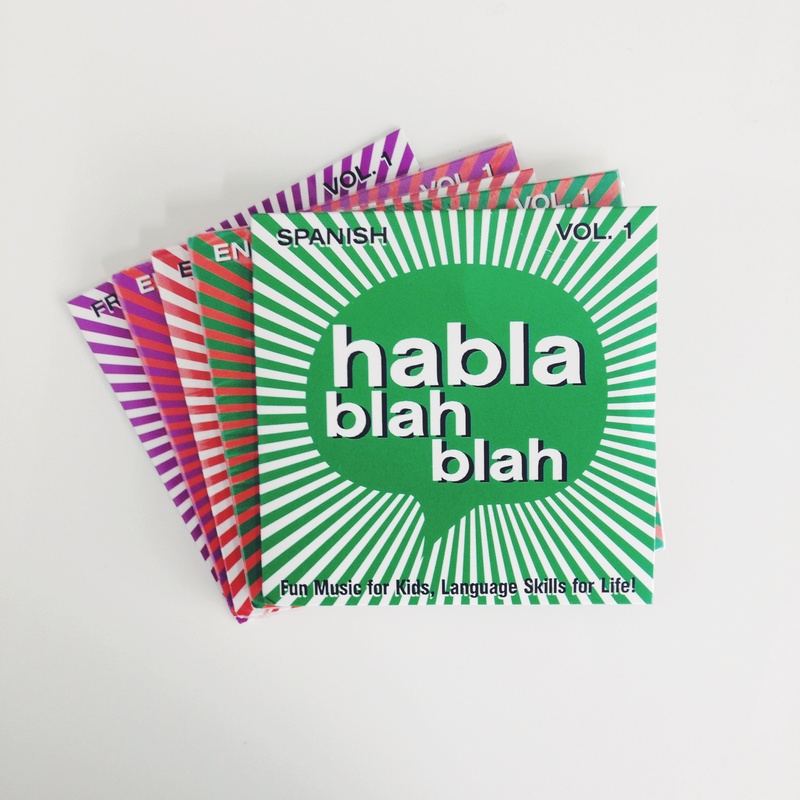 We’re giving away one complete set of the 5 Habla blah blah CD’s featured above to one lucky winner! All you have to do is leave us a comment letting us know what language(s) you’d like your niños to learn. Then, enter the rafflecopter below. great giveaway! I want my son to speak Spanish, English and French..thanks! These look SUPER FUN!! Thanks for the chance to WIN!! I’d like my little one to learn Spanish, French, and Japanese. L1 is Spanish and the target language is English. I would love to use this music in my bilingual (English/Spanish) storytime programs. I don’t have kiddos of my own yet, but when I do I hope to raise them trilingual – English, Spanish and Japanese. I love for my daughter to learn English, Spanish, French and Italian. My son loves the song los grandes elefantes! Glad to hear that habla blah blah has some new material. We are teaching both English and Spanish. I’m already a subscriber. At least Spanish and English, after that it’s up to her. What a great giveaway! I would love for my nephew to learn Spanish! Spanish for sure and maybe Portuguese. I am an email subscriber. We love listening to music like this together! So much fun! Learning through music is always such a great idea! I am colombian mother of 5 kids . I want my kids bilingual Spanish and English… Currently trying to expose them to French.. I think it is very good for the kids …for their development and future. Spanish and English I am already a subscriber. I would love my kiddos to speak spanish and english. Though not an option for this music, I would love to add some italian and chinese as they get older. Spanish and English would be wonderful! I am a subscriber. We’d like our children to learn French or German. Chinese is offered at our dual-language immersion school after 3rd grade. I would like my baby to learn Spanish and Italian. I would choose the Spanish one – we are working on Spanish at home! I subscribe to the SB email. Spanish of course…& French too! Thank you for all of this response – I love it!!! Trust me, we can’t wait to expand into other languages… and will keep you posted with that! In the meantime, Habla Blah Blah just took home the honors for BEST CHILDREN’S SONGWRITER @ the 2013 Indie Music Channel Songwriter Awards. Thank you for supporting us and listening!! composicion del website representa algo soso. De todas formas, Alucinante web-post. ﻿ No sse muy lo suficiente la agudeza que has intentado hacer comentarios. No importa me chifla tu pagina web. ﻿ Me chifla la pagina. ¿Serias Tan Amable De decirme pocos cheats dde edicion?. ﻿Que No me parece que lo que has posteado sea sin duda de esta manera. Deberas documentarte mejor o mejorar las raices de indicacion. On Monday lunchtime I get an email from the leader of the group informing methat I now need to supply a buy to let insurance copy ofthe lease, will be 51 per cent pre-let.